Fate's Maze is based in the Twin-Cities metro area of Minnesota in the USA. The name "Fate's Maze" is a metaphor for life. Life is a maze. Your path through life is determined by the choices available to you (circumstance) and the choices you make (free will). The music is melodic, dramatic and thought provoking. Songs range from the more standard structure & instrumentation for rock/metal to the more unconventional, including some spoken word and sound effect samples for dramatic effect. The Gothic Dreams CD is available through cdbaby.com, Amazon.com and retailers using Alliance Entertainment Distribution. The CD is a collection of fourteen songs with lyrical content that more often than not deals with people caught up in extraordinary circumstances. Fairy tales, nightmares, heroic endeavors, stories of love, faith and hope. Six of the songs are covers from major artists from when they indulged themselves in darker music. Most of the covers are deep cuts from popular albums. Several of the songs include vocals from Tracey Cramer-Kelly. She is a published author (Indie Award Finalist), entrepreneur, helicoptor pilot, “biker chick” and of course an accomplished singer. Check out her web site. and her version of the song "The Rose" on CD Baby. Thinking of You is the first track on the CD and is being released as the first single. It is the story of a soldier caught behind enemy lines thinking of the love he left back home. 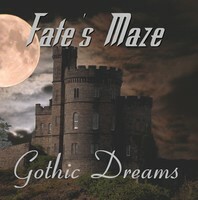 Gothic Dreams is the title track and tells the story of a man haunted by the ghost of a "fair young maiden" who is held captive by an evil "beast". The Viking Age is about a historically typical Viking leader and how the Vikings viewed life and death. The actual "Viking Age" was from approximately 800 AD to 1300 AD. As in the first verse of the song, Viking swords were carved with magic Runes and were normally handed down from father to son. The Vikings were well known for their sailing and navigation skills. Using Sunstone (which naturally polarized light) to locate the sun on cloudy days and lodestone (to magnetize an iron needle) to find magnetic North. The Vikings were superstitious and believed they could not escape their destiny, that everything was fated. So that there was no reason to ask why. Rune Masters were experts in the reading and use of Runes for divination and sorcery. They were often consulted before battles. The bravest of slain warriors were believed to be brought to Valhalla by the Valkyries. Valhalla was the great hall presided over by Odin the main God in Norse Mythology. The greatest honor was to be remembered in the Sagas which are Norse stories of heroic deeds. Paint It Black: written by Mick Jagger and Keith Richards. Released as a single in 1966 by the Rolling Stones, it was the first number one single in the US to feature a sitar. Rolling Stone magazine ranked it 174 on their 500 Greatest Songs of All Time. I Love the Night: written by Donald Roeser and originally recorded by Blue Oyster Cult on their 1977 "Spectres" album. The song is a romantic styled vampire story. BOCs album version of the song does not include the third verse which they include when performing it live. Nosferatu: written by Joe Bouchard and Helen Robbins (Helen Wheels). Originally recorded by Blue Oyster Cult on their 1977 "Spectres" album. The song follows the story of the Silent Film "Nosferatu" which was based on Bram Stoker's novel Dracula. A truly classic horror film. In the Blue Oyster Cult FAQ I found the following: "In the original silent version of Nosferatu, the captain's log can be seen to include the lines 'Rats in the hold. My crew is dead. I fear the plague'." So that some of the lyrics actually include text directly from the movie. Kings and Queens: written by Thomas Hamilton, Joey Kramer, Steven Tyler, Brad Whitford and Jack Douglas. Originally recorded by Aerosmith on their 1977 "Draw the Line" album. Steven Tyler is quoted as saying "I've always had a fancy to do songs about anarchy and the church and the government... This one was just about how many people died from holy wars because of their beliefs, or non-beliefs." The Prophet: written by Wayne Ulaky and John Lincoln Wright. Originally recorded by the Beacon Street Union on their 1968 "Eyes of the Beacon Street Union" album. The Beacon Street Union were a Boston psychedelic band that was a part of MGM's "Bosstown Sound". "The Prophet" was the last and arguably the darkest song on the album. A cry for release from this veil of tears. All tracking and mixing done at the Audio Addiction project studio. Graphic design by Snarl Co. Manufactured in the U.S.A. by Oasis Disc Manufacturing. Made with certified green components. CD tray made from 100% postconsumer water bottles. Copyright 2012 Fate's Maze All Rights Reserved. Unauthorized duplication is a violation of applicable laws.